Most traders who go about trying their luck with FX trading often fall prey to the usual tried and tested approach which in reality seems like the usual point of entry to Forex. There are numerous websites that sell or giveaway a remarkable trading system promising them riches, only to fall flat on the promises. Then, there are books and tons of them. Some have gone on to become best sellers giving one an impression that perhaps there is a nugget of gold hidden somewhere in the book. But truth be told, no matter how many books one reads or continues their endless pursuit of finding the trading system, if the trader does not understand how the prices are depicted on chart, no amount of hand holding will help a trader to be successful in their endeavor. If you are one of those traders who feel confused with the numerous chart patterns, candlestick patterns with fancy names, or find it hard to draw trend lines or support and resistance lines, then it is about time to reconsider your trading approach. Just as a driver would pull aside their car and give it a complete overhaul after repeated issues, the same it is with trading as well. Day trading with Renko charts offers a simplistic approach to trading. Not new, and in fact as old as candlestick charts, Renko charts was given to the world by the Japanese, who also gave us the candlestick charts. Despite them being ancient, somewhere in time, Renko charts lost their prominence. And in most cases, traders tend to switch to Renko charts after continued failure with using candlesticks or other conventional charting methods. To define Renko charts, they simply depict price movements at defined pips or points. For example, a 10 pip Renko chart would plot the bricks when price moves (and closes) 10 pips higher in an uptrend of 10 pips lower in a downtrend. 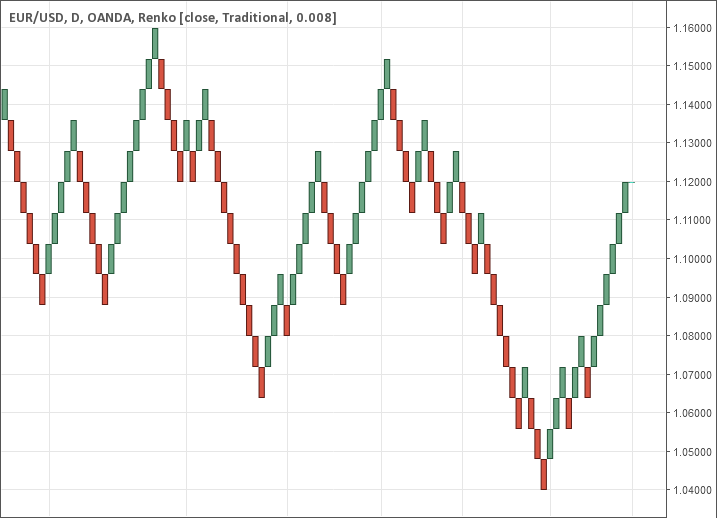 One of the distinctive advantages Renko charts have to offer is the fact that they are not time dependent. Therefore, new Renko bricks are plotted only when price moves up or down for the specified number of pips. Expressing in the most layman of terms, a very basic and simple Renko charts trading approach would be to firstly trade in the direction of the established trend and to buy at a retracement low or to continue buying when a new Renko brick is plotted. Perhaps this simple approach could be further refined by adding a 10 or 20 period (in this sense, bricks) moving average to help find the retracements. Day trading Renko charts also offers an advantage that traditional charting methods do not. Due to the fact that a new Renko brick is plotted after price moves a defined X number of pips, money management, or specifically risk management can be easily factored in by just looking at the Renko chart. For example, buying in an uptrend at a retracement low occurring close to a moving average would infer that the trader would place their stops at a previous or the most recent support level, a few pips below the Renko brick. To conclude this article, if you are trader considering an overhaul of your trading system, give Renko charts a try. Their simplistic nature ensures that the most obvious and important factors such as support and resistance can be easily established, and not to forget the obvious trends that Renko charts show with ease. Ranga, is a full time Forex trader and a blogger at Renko Traders and trades specifically using Renko charts. He is well experienced and brings his mix of technical analysis including both price action as well as indicators based trading applied to Renko charts.